Take Rt 11 into Berwick. Turn left at Burger King (Warren St). Go up to the third stop sign and turn left onto Second Ave.
6:00 PM Vespers, followed by Holy Confession. At the turn of the twentieth century and until the year 1907, a group of thirty or more immigrant families of Slavic and Russian descent settled in the western part of Berwick. Their goal was to find work and locate a place to worship God. Most secured employment at the local American Car and Foundry Corporation. They purchased a church and property located at the corner of First Ave and Warren St. In order to comply with the regulations of the Eastern Church, where the altar faces east, the building had to be turned on its foundation. However, due to minor differences in dialect and control of the church dissolution resulted with the church becoming the property of the Ukrainian element of the pioneering group. The Russian group then rented rooms in a large store building, which was directly across from the present church. Services were conducted there from 1909 to 1910. The Rev. Andrew Bohoslavsky conducted the first Divine Liturgy. Rev. Besishkin succeeded him. Through his efforts and the cooperation of the parishioners, it was decided to erect a church. A wooden structure was constructed in 1910 upon land purchased from Mr. Percy Shiner. On Thanksgiving Day in 1910, the late Metropolitan Platon dedicated the new church. The congregation worshiped there until a fire destroyed the church. Services were held in the basement of the church, which was only slightly damaged. Rev. Stephen Sopaida was the new rector at this time. A brick building was soon constructed over the site of the destroyed church. Services were held in the parish home until work was completed in 1923. Bishop Stephen Dzubay dedicated the new church. In 1924, Rev. Peter Karaffa served the Church. Rev. John Simeon Bogan served the church in 1925 and organized the Russian Glee Club. After his death, Rev. Aftanasia Hubiak served until his transfer to Akron, Ohio. During this time, a twenty-foot addition was built in 1931 and an Iconastas erected to beautify the interior. Rev. Michael Sotak followed until his transfer. Rev. John H. Gaydos served for approximately ten years. Reverends Stephen Rusinak and Michael Rachko followed him. A church addition, Iconostas, and cemetery grounds were dedicated in 1953. Very Rev. Petretzky was rector at this time. He was followed by Reverends Buben, Ugrin, Labowsky, Heiromonk Roman (Serdynski), Reverends Rental, and Cucura in that order. Rev. Paul Holoviak was rector from 1967 to 1971. 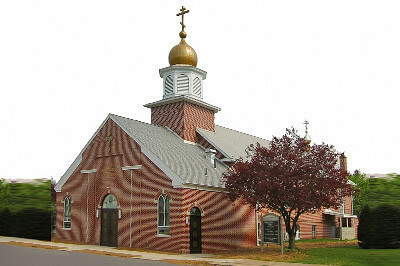 A new parish home was built and dedicated on July 18, 1971. Very Reverend Andrew Shuga then served the parish from 1971 until his death in 2001. During that time, renovations were completed on the Iconostas, new icons were commissioned and installed on the interior walls of the church, and the cupola restored. The church’s annual picnic was re-instituted and became a major source of revenue for the church. Rev. James Weremedic came to serve the parishioners of the church in early 2001. Renovation tp the kitchen was completed in the Fall of 2001 and dedicated on January 19, 2002 to the memory of Very Reverend, Father Andrew Shuga. In the summer of 2004, work began on a $400,000 addition. This project included a vertical lift to three levels, a library and meeting room, handicapped-accessible bathroom, additional storage areas, the enclosing of the front steps, several stained-glass windows and iconography, and the refurbishing of the Altar Table. His Grace, Bishop Tikhon blessed the additions on May 321, 2005. By the grace of God, may Father James’ spiritual leadership help our church family grow, in numbers and in Christ. Our Orthodox Church is comprised of the warmest and friendliest people on earth. When you come to our church, seeped in a 2000 year old Christian Tradition and handed down from generation to generation, you will see brothers and sisters that the Holy Spirit has filled with such light and peace to the point that they are practically brimming over with the love of Christ. And all of these blessings we have received are there for the taking to any who would come and find out about the glories of the Orthodox Faith. The Orthodox Church is not an institution or building or rigid doctrine, but rather it is people of God. Specifically, people who affirm and share a common faith and hope in God’s love, with Christ as the head of His people, the Church. The Orthodox Faith offers service to God based on the foundations handed down by the Apostles and Martyrs, as mentioned in the Acts of the Apostles. The Tradition of our fathers is maintained through Apostolic Succession. Apostolic succession is the handing down of the True Tradition through the laying on of hands, from Apostles to Bishops, and Bishops to Priest, continuing through the ages right to today. In addition to the laying on of hands, Apostolic Succession means that we are true to Holy Tradition. Although people are fallible, it is through the Church, guided by the Holy Spirit, that the True Tradition has been maintained. Once one enters into an Orthodox Church building, the Iconography is typically the most captivating detail one remembers. Each Icon adds to one experience not only from the theology visually presented, but in knowing that many icons over the centuries have been associated with miracles. Our liturgical worship is deeply rooted in Scriptural context, including the Old Testament experiences transformed by Jesus Christ. The use of incense, candles, vestments, and music cause us to use all our senses during our worship of our Lord and Saviour, Jesus Christ. The Divine Liturgy is truly a life altering experience, a ‘Heaven on earth’. As the pastor I invite you to come to attend the most glorious Liturgical service, knowing my weaknesses, but also knowing the strength of the Church itself, the love of the people, the glory of the Divine Liturgy, the 2000-year-old Tradition of the Orthodox Faith. Glory ... is what our Church has to offer ... and love from all our wonderful members. As Orthodox Christians, we are called out of the world while remaining in this world. We strive closer to God every minute, whether in the physical Church building or in the community we live. Every action has a significant cosmic effect, whether we are praying for others or helping with ones physical needs. Many members are involved with community activities such as the Soup Kitchen, United Way, Red Cross, Berwick Hospital, Meals on Wheels, and others. Also the members visit the homebound during the Nativity season singing in the homes and the Berwick Retirement Village. During the tragic attack in NY, we held a special prayer service, a Molieben, praying for all affected and we held a memorial service on the evening of September 11, 2002. Through our Out-Reach committee, we have begun a monthly newsletter called the Fisherman’s Net. This publication provides informative articles on Orthodoxy and specific events at Holy Annunciation Orthodox Church in Berwick. The OutReach Committee published a Pictorial Directory of our Church family through Olan Mills. Of course, many people know the Orthodox through the rich ethnic customs, especially the food. Our HALO (Holy Assumption’s Ladies Organization) continues to bake ethnic foods throughout the year, offering them for sale in support of the Parish finances. For more information, Fr. James is available to answer your call, e-mail, and to meet with you in person. Please come to either a Vesper service on Saturday evening at 6:00pm (4:00pm during the Winter months) or the Sunday Divine Liturgy at 9:30am. The Divine Liturgy is followed by a coffee/fellowship hour so you would have time to talk with everyone. Glory be to Jesus Christ! Glory be forever!